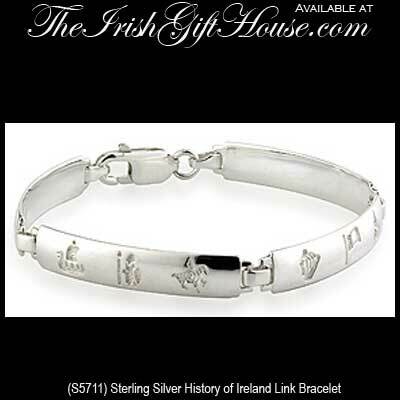 History of Ireland bracelet features 4 sterling silver links. This sterling silver History of Ireland bracelet measures 1/4" wide by 7 1/2" long, including the lobster claw catch. Each of the four links is enhanced with 3 of the 12 symbols and this History of Ireland bracelet is gift boxed with the legend booklet that explains the symbolism. Each piece of History of Ireland jewelry is made by Solvar Jewelry in Dublin, Ireland; it is available at The Irish Gift House.